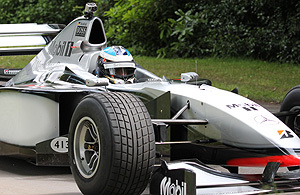 The 2012 Goodwood Festival of Speed took place between 28th June – 1st July. The theme for 2012 was ‘Young Guns – Born to Win’ which celebrated drivers, riders, designers and engineers who shocked the establishment and gained immediate superstar status. From the world of Formula 1, famous names at the event included McLaren drivers Jenson Button and Lewis Hamilton plus double Formula One World Champion Sebastian Vettel, who appeared at Goodwood for the very first time. One of the Festival of Speed’s most memorable moments was celebrated at this year’s event, when Nick Heidfeld was reunited with the McLaren MP4/13 that he famously raced up the Goodwood Hill in a record time of 41.6 seconds in 1999. Visitors were treated to a stunning display of cars and bikes from various decades and categories of motorsport both on the hill and off. Goodwood Action Sports (GAS) arena put on a display of FMX, MTB TRIALS, BMX FLATLAND, TRIALS & BMX DIRT. Famous names present included four-time Red Bull X-Fighters podium finisher, Eigo Sato (FMX) & Dougie Lampkin (Trials) who has won five consecutive World Indoor and seven consecutive World Outdoor Championships.